A new tomb is taking shape in Egypt's Valley of the Kings — and this one will look exactly like the famous 3,400-year-old tomb of King Tutankhamun. The full-scale facsimile of Tut's burial chamber, created by a Spanish art studio called Factum Arte, is based on seven weeks' worth of 3-D scanning and photo documentation of the original in 2009. Panels for the interior were produced in Madrid from plastic resin and huge, wallpaper-like photographs. A worker involved in construction of a facsimile of King Tutankhamun's tomb in Egypt's Valley of the Kings installs the first panel of the east wall of the burial chamber. When the "rematerialized" tomb is finished and opened to the public in late April, it will offer a faithful representation of the burial chamber in its current state, "down to the dust coating that was there in the weeks that we recorded," said Adam Lowe, Factum Arte's founder. "We're hoping that we can set something up where visitors can start to say the experience of the facsimile is better than the original," Lowe told NBC News. The original tomb of Tutankhamun is still open to visitors willing to pay about $15 (100 Egyptian pounds) for a tour. But the tomb's condition has suffered from environmental exposure in the decades since Carter unearthed the site in 1923. Lowe hopes the facsimile will boost Egypt tourism in the wake of the past few years' political turmoil. He also hopes it will spark a debate over the resilience — and fragility — of the world's cultural heritage. 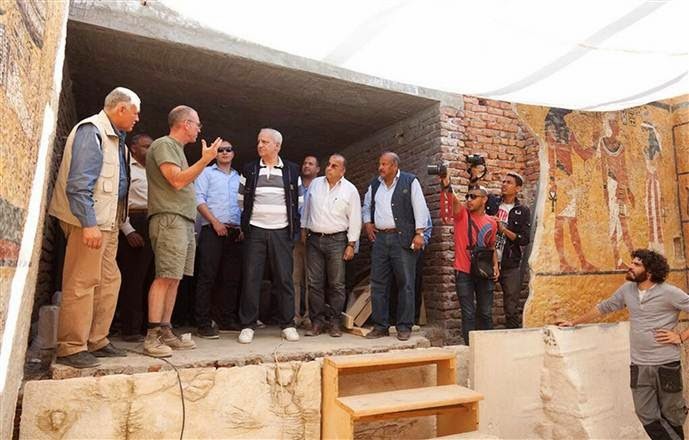 Egyptian Antiquities Minister Mohamed Ibrahim and other officials visit the construction site for a facsimile of King Tut's burial chamber, next to the Howard Carter House in the Valley of the Kings. "The aim is to make visitors aware of the exceedingly complicated task of preserving a site that was meant to last for eternity, but was not meant to be visited," he said. "For 3,300 years, the tomb was in perfect condition, but in the last 91 years it has suffered terribly. We don't want people to stop going. We want them to become aware of the contract that's necessary to sustain heritage sites like this." 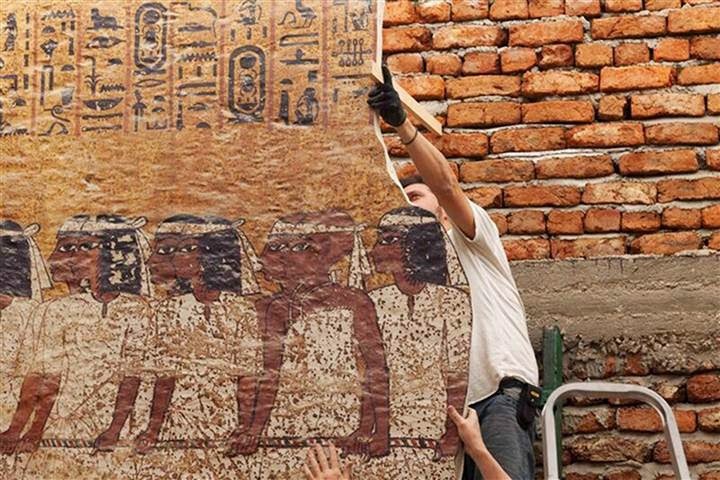 After Tut, Lowe said Factum Arte plans to rematerialize the tombs of Nefertari andSeti I — archaeological sites that have been almost completely closed to the public.